Wine has traditionally been sold by the bottle, and bottles have long been preferred by consumers. In 1994, Barokes introduced canned wine to the market but cans struggled to gain acceptance until recently. In the last few years, canned wine has made a significant market penetration, with tremendous growth since 2016. And, it doesn’t look like sales are going to slow down anytime soon. As wine consumption has moved from special occasions to an everyday beverage, canned wine has been becoming increasingly popular with wine drinkers. In 2012, the total sales for canned wine hovered around $2 million. But in 2016, Nielsen reported a massive 125% increase in canned wine sales, reaching a total of $14.5 million — quite a substantial increase. Canned wine sales skyrocketed further in 2017, up 54%. This was the highest growth rate of any alternative wine packaging. Today canned wine sales exceed $28 million, with all indications that they will continue to grow. The growth of canned wine sales leads to an important question – who is buying it? The shift in packaging preferences appears to be driven by a new demographic of wine drinkers coming to the market. Melanie Virreira, marketing team leader for Ball Corporation in North and Central America, attributes the sales to millennials. 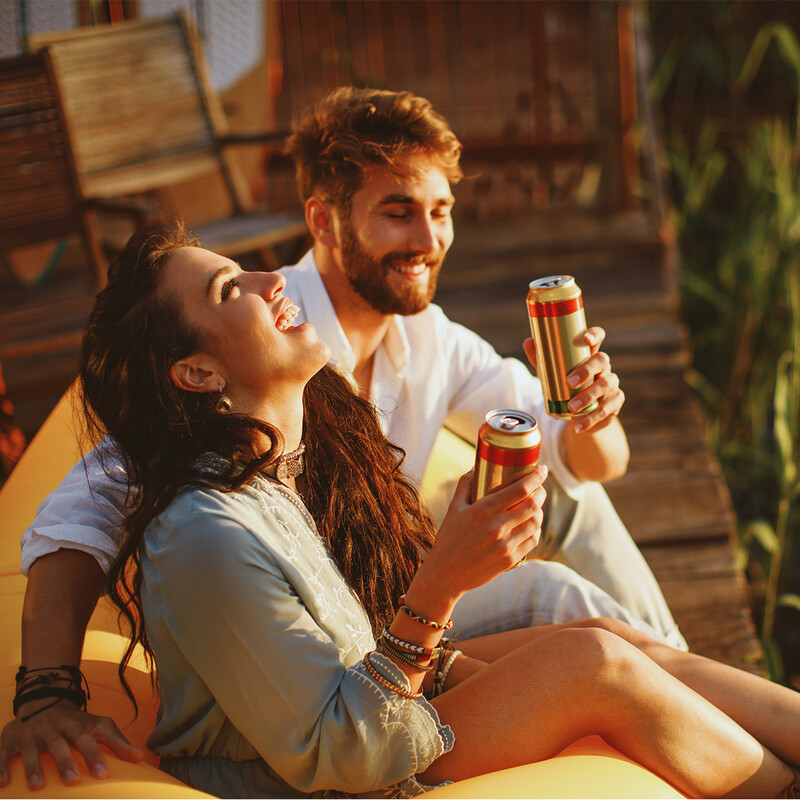 “We have a new wave of younger drinkers who are very receptive to new packaging types and unconcerned with the traditional ways of consuming their favorite beverage”. Of course, millennials aren’t the only ones buying canned wine. Many people are finding that a can of wine is simply more convenient than a bottle. For example, a single serving can of wine works great in a recipe without having to open up a fresh bottle and golfers may find that a can of wine allows for easier social drinking between holes. Convenience will continue to be a major factor in the growth of canned wine buying. According to a Nielsen survey in 2016, 73% report that, when picking a packaging type, ease of carrying is a significant consideration and 49% of those surveyed reported that single-serve packaging was somewhat important to them. Producers are still experimenting with the perfect size for a can of wine, but a single serving of 187 mL is most common. At one fourth the size of a traditional bottle of wine, it’s easy to manage. Canned wine comes in other sizes as well, but only three (the 187 ml, 350 ml, and 500 ml) are legal to sell as a single. The single serving size allows for wine sales in locations where it was challenging to do so in the past. Ryan Harms, owner, and winemaker of Union Wine Co states, “Putting wine in a can not only saves on packaging costs (Harms estimates 40 percent less), it opens up the wine-drinking experience where it had previously been difficult, such as outdoor events or when portability is needed”. For consumers and on-premise sellers, canned wine means there are no open bottles of wine to spoil, which helps control product loss. Sporting venues and outdoor locations appreciate the non-breakable nature of cans. Single-serve cans allow winemakers to penetrate portions of the market where they previously couldn’t enter. Additionally, sparkling wines are challenging to keep carbonated after the bottle is opened. In the past, this often kept the bubbly stuff reserved for special occasions where it wouldn’t go to waste. But with individual cans, this is not an issue. This flexibility may help to spur sales of sparkling wines. Last summer Trader Joe’s came out with a sparkling wine in a can as a new product. It was so well received that they could not keep the product in stock. Since the popular 187ml single serving size of canned wine is one-fourth of a traditional 750ml bottle of wine, consumers might expect it to cost a fourth of the price of the bottle. This can make it challenging for brands that are well-established in bottle format to price single-serve cans profitably. Some producers have avoided this concern with new canned wine brands that don’t offer a bottle equivalent. What is the best target price for this product? Historically, Americans have a tolerance for buying single items that are $10 or under. In most cases, the 187ml size retails for $5 while the 250 ml size goes for around $7. Of course, prices vary depending on the brand and quality of the product. Even luxury wines are making their way into cans. French winemaker Winestar offers a range of canned wines from 12 different appellations and every 187 ml can proudly carries the pedigree of the product inside. Winestar has taken an additional step in its packaging of fine canned wine by creating a new technology, called Vinsafe, that prevents any hint of a metallic aftertaste from the aluminum can. The barrier apparently works quite well and has been approved by two Masters of Wine. Many other canned wine manufacturers are using a similar coating. Maryland’s Old Westminster Winery, which puts out high-end, craft wines, tested a pilot run of three wines fermented with wild yeast and canned without fining or filtering. After their first 500 cases run sold out in a month they continued with 2,000 cases of seasonal installments in 2018. Canned wine has taken some time to find its footing in the market, but thanks to a new market of Millennial wine consumers who are are unfettered by conventional expectations around wine packaging and an all-ages demand for more convenience, it’s clear that the time for canned wine has arrived.